The Melon Patch – USWSESSC Inc.
It’s official! We’ve nailed down our schedule of events for this year’s festival. Grounds are open from 10:00am to 4:00pm. 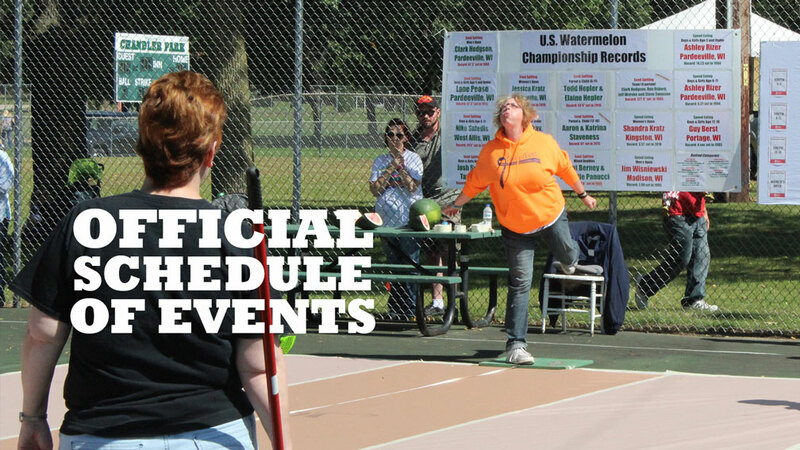 The Pardeeville Student Council will be running the Watermelon Midway, hosted by the Watermelon Festival, starting at 10:00am. The Open Air Market with vendors, crafters, and artists, will also open at 10:00am. Entertainment for the kids starts at 10:30am at Shelter 3. This year’s performer is Magic of Isaiah! Kid’s free hay dive is on the in-field by the games this year and starts at 11:30am. Championship events start promptly at 12:30pm. Make sure to arrive by noon to be ready to compete. And as always, we are searching for melonheads – dedicated volunteers to help with our festival. You can show up day of to help empty trash cans, or the day before to assemble the games, or help in the next few weeks putting up posters – we have a job for you. Send us a note on our contact form. 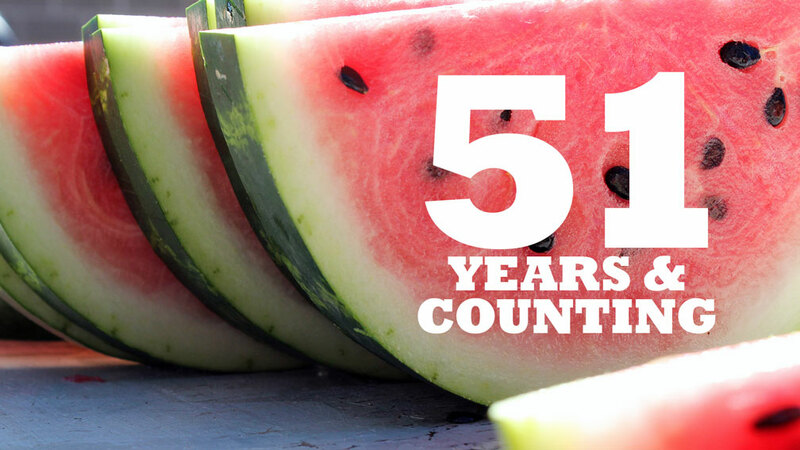 Summer may have started here in Pardeeville, and with July 4th just a few days away, we’re already just ELEVEN WEEKS away from this year’s Watermelon Festival! Elaine Hepler broke the world record (Youth 6-11) in seed-spitting last year with a spit of 27′-1″. Tim and Rebecca Swartz of Taylor, WI, won Mixed doubles with a combined seed-spit of 86′-4″, which broke the world record set back in 1986 by Kent Berney and Michelle Panucci with a combined total of 72′-6″. Shanda and Justin Briant won speed-eating last year with 7.91 seconds and 5.75 seconds (respectfully). Last year’s attendance was the best ever, estimated around 2000. Clark Hodgson still holds the world record spit in the Men’s Open category with 61′-3″ set back in 1988. Shanda Kratz (now Briant) still holds the world record in speed-eating with 3.57 seconds, set back in 2010. Some of the original official championship rules are still in effect, including: People who wear dentures, whose teeth go further than the seed shall abide by judges decision: Distance seed travels is the only thing that counts. Poly-grip available on request. Our volunteers and sponsors are what keep our festival continuing to grow every year. See last year’s list here. Make sure to follow us on Facebook, Twitter, Tumblr, and Google+ for upcoming details on this year’s festival. All our social links are below. And to wrap up our list, WE’RE ONLY 11 WEEKS AWAY! So get training!